The celebration of the festival takes place on the very next day of Holi, a famous Hindu festival. The name Hola is known to be a masculine name which has originated from the feminine name Holi. Both of these fabulous and appealing occasions differ significantly in their tastes and celebrations though. The Hindu festival Holi is an occasion of colors. During Holi water and various colorful powders are speckled all over the places where as Hola celebration is very much related to the war simulation. It is celebrated rather in a serious mood and it exhibits martial skills in replicated combats. However, tourists and visitors can enjoy and get surprised for the striking skills of the performers. 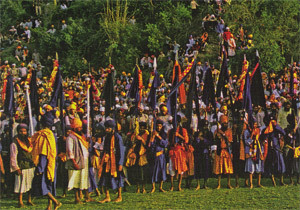 The three days long fascinating carnival has the power to enchant and amuse tourists by innovative mock fights, music, poetry competitions and Kirtans (A special kind of songs). It is believed that the word Mohalla has its roots in the Arabic Hal. The Arabic word Mahalla means a place for celebrating triumph. This festival has always recalled the story of rebellious soldiers and ethnicity. This is why the festival has aptly transformed into an occasion of celebrating conquest.